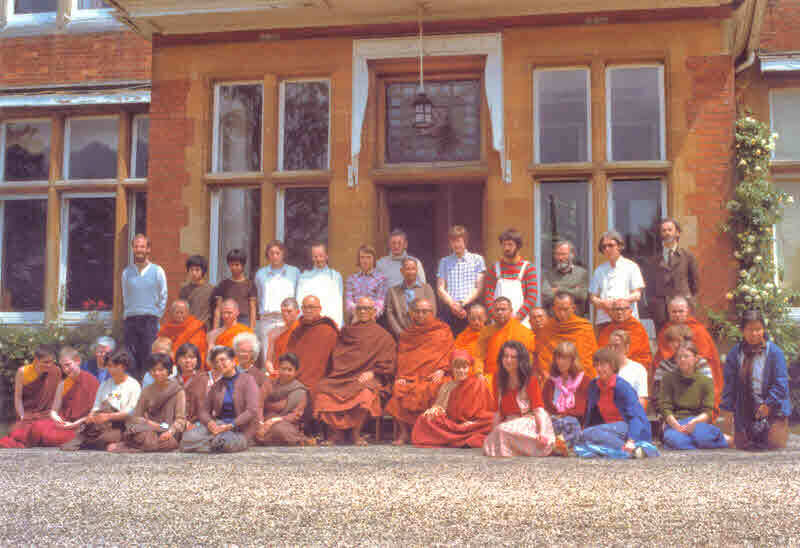 When Venerable Mahāsi Sayādaw came to the UK in 1979 he spent about one month teaching Vipassanā at Oakenholt Buddhist Centre, at Farmoor, near Oxford. Many devout Buddhists ordained temporarily to practise meditation under the Sayādaw’s expert guidance. Sitting to the Venerable Mahāsi Sayādaw’s left, is Chanmyay Sayādaw U Janaka, who served as his interpreter during his foreign mission. Seated just in front of U Janka is Mrs Ruth Dennison, a well-known teacher of Vipassanā meditation in the tradition of Sayagyi U Ba Khin. Bhikkhu Pesala is seated at the extreme right of the photograph. The tall slim young man in the blue-check shirt standing at the back behind U Janaka is now known as Ajahn Karuniko, a senior monk in the English Forest Saṅgha.